Like the Schrödinger's Cat paradox, the 1935 thought experiment proposed by Albert Einstein, Boris Podolsky, and Nathan Rosen (and known by their initials as EPR), was originally proposed to exhibit internal contradictions in the new quantum physics. Einstein hoped to show that quantum theory could not describe certain intuitive "elements of reality" and thus was either incomplete or, as he may have hoped, demonstrably incorrect. Einstein was correct that quantum theory is "incomplete" relative to classical physics, which has twice as many dynamical variables that can be known with arbitrary precision. But half of this information is missing in quantum physics, making it statistical. Werner Heisenberg's indeterminacy (or uncertainty) principle allows only one of each pair of non-commuting observables (for example momentum or position) to be known with arbitrary accuracy. Einstein and his colleagues Erwin Schrödinger, Max Planck, and David Bohm, initially hoped for a return to deterministic physics, and the elimination of mysterious phenomena like the superposition of states and the "collapse" of the wave function. EPR continues to fascinate determinist philosophers of science who hope to prove that quantum indeterminacy does not exist. Einstein was correct that indeterminacy makes quantum theory a discontinuous and statistical theory. Its predictions and highly accurate experimental results are statistical in that they depend on an ensemble of identical experiments, not on any individual experiment. Einstein wanted physics to be a continuous field theory, in which all physical variables are completely and "locally" determined by the four-dimensional field of "space-time" in his theory of relativity. In his autobiography, fifteen years after EPR, Einstein explained his problem in very simple terms "Does a particle have a position in the moments just before it is measured?" If not, the quantum theory is incomplete. Since quantum theory says the particle may have a number of possible positions, with calculable probabilities, it is not only an incomplete theory, it is a theory with alternative possibilities. Einstein saw this as is in conflict with his idea of an external objective reality independent of our subjective experiments. In the "block universe" of Einstein's relativistic field theory, there is only one actual past, with determinate positions for a particle at all past times. Einstein's theory is causal. Quantum theory is acausal. Better perhaps is to call it statistically causal, since it also gives us a statistical determinism, when we average over enough indeterministic microscopic events.. But Einstein was also bothered by what is now known as "nonlocality." This mysterious phenomenon exhibited in EPR experiments is the apparent transfer of something physical faster than the speed of light. What happens actually is merely an instantaneous change in the information about quantum probabilities (actually complex probability amplitudes). Einstein had first suspected "nonlocal" behavior in 1905 in his paper on the light-quantum hypothesis. How, he wondered, could a spherical wave of energy, spread out in a large volume of space, gather itself together instantly to be absorbed as a complete unit by a tiny atom? The heart of the problem of nonlocality is nothing more than the instantaneous "collapse" of the wave function. But in EPR we have a two-particle wave-function describing the "entangled" particles, instead of a one-particle wave function interfering with itself. The 1935 EPR paper was based on an earlier question of Einstein's about two electrons fired in opposite directions from a central source with equal velocities. He imagined them starting at t0 some distance apart and approaching one another with high velocities. Then for a short time interval from t1 to t1 + Δt the particles are in contact with one another. Most misleading and confusing accounts of entanglement and nonlocality begin with the idea that distinguishable particles separate - particle 1 goes one way and particle 2 the other. After the particles are measured at t1, quantum mechanics describes them with a single two-particle wave function that is not the product of independent particle wave functions. Because electrons are indistinguishable particles, it is not proper to say electron 1 goes this way and electron 2 that way. (Nevertheless, it is convenient to label the particles - after subsequent measurements - as we do in illustrations below.) Until the next measurement, it is misleading to think that specific particles have distinguishable paths. Einstein said correctly that at a later time t2, a measurement of one electron's position would instantly establish the position of the other electron - without measuring it explicitly. Schrödinger described the two electrons as "entangled" (verschränkt) at their first measurement, so EPR "nonlocality" phenomena are also known as "quantum entanglement." Note that Einstein used conservation of linear momentum to calculate the position of the second electron. Although conservation laws are rarely cited as the explanation, they are the physical reason that entangled particles always produce correlated results. If the results were not always correlated, the implied violation of a fundamental conservation law would be a much bigger story than entanglement itself, as interesting as that is. This idea of something measured in one place "influencing" measurements far away challenged what Einstein thought of as "local reality." It came to be known as "nonlocality." Einstein called it "spukhaft Fernwirkung" or "spooky action at a distance." It is better to think of it as "knowledge-at-a-distance." Einstein had objected publicly to nonlocal phenomena as early as the Solvay Conference of 1927, when he criticized the collapse of the wave function as "instantaneous-action-at-a-distance." He said that the probability wave could not act simultaneously at different places on the screen, which are in a "space-like" separation, without violating his theory of relativity. Einstein's criticism resembles the criticisms of Newton's theory of gravitation. Newton's opponents charged that his theory was "action at a distance" and instantaneous. Einstein's own theory of general relativity shows that gravitational "influences" travel at the speed of light and are mediated by a gravitational field that shows up as curved space-time. An allowable "action-at-a-distance" is one that is caused by "local" events, those in its past light-cone. Both gravitation and electromagnetism are field theories, in which physical variables are functions of the four "local" space-time coordinates of Einstein's theory of relativity. Any disturbance at one point in the field can only "influence" another distant point by propagating to that point at the speed of light. But the quantum-mechanical wave-function is different. It is neither matter nor energy, nothing physical, only information and "probability amplitude." When a probability function collapses to unity in one place and zero elsewhere, nothing physical is moving from one place to the other. When the nose of one horse crosses the finish line, its probability of winning goes to certainty, and the finite probabilities of the other horses, including the one in the rear, instantaneously drop to zero. This happens faster than the speed of light, since the last horse is in a "space-like" separation. The first practical and workable experiments to test the EPR paradox were suggested by David Bohm (though they were not realized for almost two decades). Instead of only linear momentum conservation, Bohm proposed using two electrons that are prepared in an initial state of known total spin. If one electron spin is 1/2 in the up direction and the other is spin down or -1/2, the total spin is zero. The underlying physical law of importance is a second conservation law, in this case the conservation of angular momentum. If electron 1 is prepared with spin down and electron 2 with spin up, the total angular momentum is also zero. This is called the singlet state. The standard theory of quantum mechanics says that the prepared system is in a linear combination (or superposition) of these two states, and can provide only the probabilities of finding the entangled system in either the | + - > state or the | - + > state. Quantum mechanics does not describe the paths or the spins of the individual particles. Note that should measurements result in | + + > or | - - > state, that would violate the conservation of angular momentum. In 1964, John Bell showed how the 1935 "thought experiments" of Einstein, Podolsky, and Rosen (EPR) could be made into real physical experiments, following the ideas of David Bohm. Bell developed a theorem that puts limits on Bohm's "hidden variables" that might restore a deterministic physics. Bell's theorem takes the form of what he called an inequality, the violation of which would confirm standard quantum mechanics. Since Bell's work, many other physicists have defined other "Bell inequalities" and developed increasingly sophisticated experiments to test them. spin = -1) coming from a central source. Again, the total photon spin of zero is conserved. Their data, in agreement with quantum mechanics, violated the Bell's inequalities to high statistical accuracy, thus providing strong evidence against local hidden-variable theories. For more on the principle of superposition of states and the physics of photons, see the Dirac 3-polarizers experiment. John Clauser, Michael Horne, Abner Shimony, and Richard Holt (known collectively as CHSH) and later Alain Aspect did more sophisticated tests. The outputs of the polarization analyzers were fed to a coincidence detector that records the instantaneous measurements, described as + -, - +, + +, and - - . The first two ( + - and - + ) conserve the spin angular momentum and are the only types ever observed in these nonlocality/entanglement tests. With the exception of some of Holt's early results that were found to be erroneous, no evidence has so far been found of any failure of standard quantum mechanics. And as experimental accuracy has improved by orders of magnitude, quantum physics has correspondingly been confirmed to one part in 1014, and the speed of the probability of any "information transfer" between particles has a lower limit of 106 times the speed of light. There has been no evidence for local "hidden variables." Nevertheless, wishful-thinking experimenters continue to look for possible "loopholes" in the experimental results, such as detector inefficiencies that might be hiding results favorable to Einstein's picture of "local reality." Information physics starts with the fact that measurements bring new stable information into existence. In EPR the information in the prepared state of the two particles includes the fact that the total linear momentum and the total angular momentum are zero. Note that the new observable information does not require a "conscious observer" as Eugene Wigner and some other scientists thought. The information is ontological (really in the world) and not merely epistemic (in the mind). Without new information, there would be nothing for the observers to observe. Conservation laws are the consequence of extremely deep properties of nature that arise from simple considerations of symmetry. We regard these laws as "cosmological principles." Physical laws do not depend on the absolute place and time of experiments, nor their particular direction in space. Conservation of linear momentum depends on the translation invariance of physical systems, conservation of energy the independence of time, and conservation of angular momentum the invariance under rotations. Recall that the EPR experiment starts with two electrons (or photons) prepared in an entangled state that is a linear combination of pure two-particle states, each of which conserves the total angular momentum and, of course, conserves the linear momentum as in Einstein's original EPR example. This information about the linear and angular momenta is established by the initial state preparation (a measurement). Quantum mechanics describes the probability amplitude wave function ψ of the two-particle system as in a superposition of two-particle states. It is not separable into a product of single-particle states, and there is no information about the identical indistinguishable electrons traveling along distinguishable paths. The probability amplitude wave function ψ travels from the source (at the speed of light or less). Let's assume that at t1 observer A finds an electron (e1) with spin up. After the "first" measurement, new information comes into existence telling us that the wave function ψ has "collapsed" into the state | + - >. Just as in the two-slit experiment, probabilities have now become certainties. If the "first" measurement finds electron 1 is spin up, so the entangled electron 2 must be found in a "second" measurement with spin down to conserve angular momentum. And conservation of linear momentum tells us that at t1 the second electron is equidistant from the source in the opposite direction. As with any wave-function collapse, the probability amplitude information "travels" instantly. But unlike the two-slit experiment, where the collapse goes to a specific point in 3-dimensional configuration space, the "collapse" here is a "jump" or "projection" into one of the two possible 6-dimensional two-particle quantum states | + - > or | - + >. This makes "visualization" (Schrödinger's Anschaulichkeit) more difficult, but the parallel with the collapse in the two-slit case provides an intuitive insight of sorts. If the "first" measurement finds an electron (call it electron 1) as spin-up, then at that moment of new information creation, the two-particle wave function collapses to the state | + - > and electron 2 "jumps" into a spin-down state with probability unity (certainty). The results of observer B's "second" measurement (usually assumed to be at a later time t2, but t1 at the earliest, or it would be the "first" measurement) is therefore determined to be spin down. Notice that Einstein's intuition that the result seems already "determined" or "fixed" before the second measurement is in part correct. The result is determined by the law of conservation of momentum (within the usual uncertainty) and the spin is completely determined. But as with the distinction between determinism and pre-determinism in the free-will debates, the measurement by observer B was not pre-determined before observer A's measurement. It was simply determined by her measurement. Why do so few accounts of EPR mention conservation laws? If a measurement of the momentum of one of the particles is carried out — the possibility of this is never questioned — and gives the result p, the state vector of the other particle suddenly becomes a (slightly damped) plane wave with the momentum -p. This statement is synonymous with the statement that a measurement of the momentum of the second particle would give the result -p, as follows from the conservation law for linear momentum. The same conclusion can be arrived at also by a formal calculation of the possible results of a joint measurement of the momenta of the two particles. One can go even further: instead of measuring the linear momentum of one particle, one can measure its angular momentum about a fixed axis. If this measurement yields the value mℏ, the state vector of the other particle suddenly becomes a cylindrical wave for which the same component of the angular momentum is -mℏ. This statement is again synonymous with the statement that a measurement of the said component of the angular momentum of the second particle certainly would give the value -mℏ. This can be inferred again from the conservation law of the angular momentum (which is zero for the two particles together) or by means of a formal analysis. Hence, a "contraction of the wave packet" took place again. It is also clear that it would be wrong, in the preceding example, to say that even before any measurement, the state was a mixture of plane waves of the two particles, traveling in opposite directions. For no such pair of plane waves would one expect the angular momenta to show the correlation just described. This is natural since plane waves are not cylindrical waves, or since [the state vector has] properties different from those of any mixture. The statistical correlations which are clearly postulated by quantum mechanics (and which can be shown also experimentally, for instance in the Bothe-Geiger experiment) demand in certain cases a "reduction of the state vector." The only possible question which can yet be asked is whether such a reduction must be postulated also when a measurement with a macroscopic apparatus is carried out. [Considerations] show that even this is true if the validity of quantum mechanics is admitted for all systems. Schrödinger said that his "Wave Mechanics" provided more "visualizability" (Anschaulichkeit) than the "damned quantum jumps" of the Copenhagen school, as he called them. He was right. But we must focus on the probability amplitude wave function of the prepared two-particle state, and not attempt to describe the paths or locations of independent particles - at least until after some measurement has been made. We must also keep in mind the conservation laws that Einstein used to describe nonlocal behavior in the first place. Then we can see that the "mystery" of nonlocality for two particles is primarily the same mystery as the single-particle collapse of the wave function. But there is an extra mystery, one we might call an "enigma," of the nonseparability of identical indistinguishable particles. As Richard Feynman said, there is only one mystery in quantum mechanics (the superposition of states, the probabilities of collapse into one state, and the consequent statistical outcomes). The only difference in two-particle entanglement and nonlocality is that two particles appear simultaneously (in their original interaction frame) when their wave function collapses. We choose to examine a phenomenon which is impossible, absolutely impossible, to explain in any classical way, and which has in it the heart of quantum mechanics. In reality, it contains the only mystery. We cannot make the mystery go away by "explaining" how it works. We will just tell you how it works. In telling you how it works we will have told you about the basic peculiarities of all quantum mechanics. In his 1935 paper (and his correspondence with Einstein), Schrödinger described the two particles in EPR as "entangled" in English, verschränkt in German, which means something like cross-linked. It describes someone standing with arms crossed. In the time evolution of an entangled two-particle state according to the Schrödinger equation, we can visualize it - as we visualize the single-particle wave function - as collapsing when a measurement is made. The discontinuous “jump” is also described as the “reduction of the wave packet.” This is apt in the two-particle case, where the superposition of | + - > and | - + > states is “projected” or “reduced to one of these states, say | - + >, and then further reduced to the product of independent one-particle states, | - >| + >. 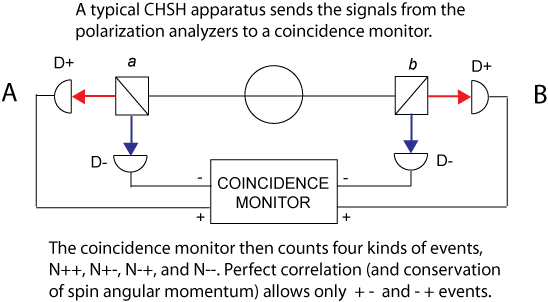 Measurement of a two-particle wave function measures both particles, reducing them to separate one-particle wave functions, after which they are no longer entangled. When entangled, the particles are nonseparable. Once measured, they are separate quantum systems with their own wave functions. They are no longer entangled. In the two-particle case (instead of just one particle making an appearance), when either particle is measured we know instantly the now determinate properties of the other particle. They are the properties that satisfy the conservation laws, including its location equidistant from, but on the opposite side of, the source, and the complementary spin. In the one-particle case, it has no definite position before the experiment, then it appears somewhere. For two particles, neither one has a position, then both appear simultaneously (in an appropriate frame of reference). Schrödinger knew that his two-particle wave function could not have the same simple interpretation as the single particle, which can be visualized in ordinary 3-dimensional configuration space. And he is right that entanglement exhibits a richer form of the "action-at-a-distance" and nonlocality that Einstein had already identified in the collapse of the single particle wave function. But the main difference is that two particles acquire new properties instead of one, and they do it instantaneously (at faster than light speeds), just as in the case of a single-particle measurement, where the finite probability of appearing at various distant locations collapses to zero at the instant the particle is found somewhere. Can a Special Frame Resolve the EPR Paradox? Almost every presentation of the EPR paradox begins with something like "Alice observes one particle..." and concludes with the question "How does the second particle get the information needed so that Bob's measurements correlate perfectly with Alice?" Einstein asked whether the particle has a determinate position(or spin) just before it is measured. Even if it does not, we can say that the electron spin was determined from the moment the two-particle wave function collapsed. Recall that the two-particle wave function describing the indistinguishable particles cannot be separated into a product of two single-particle wave functions. When either particle is measured, they both become determinate. Influences from Outside Space and Time, Even Back from the Future! John Cramer's Transactional Interpretation of quantum mechanics and other Time-Symmetric Interpretations like that of Yakir Aharonov and K. B Wharton also search for Archimedean points "ouside space and time." Gisin and his colleagues have extended the polarized photon tests of EPR and the Bell inequalities to a separation of 18 kilometers near Geneva. They continue to find 100% correlation and no evidence of the "hidden variables" sought after by Einstein and David Bohm. An interesting use of the special theory of relativity was proposed by Gisin's colleagues, Antoine Suarez and Valerio Scarani. Their "Before-Before" experiment uses the idea of hyperplanes of simultaneity. Back in the 1960's, C. W. Rietdijk and Hilary Putnam argued that physical determinism could be proved to be true by considering the experiments and observers A and B in the above diagram to be moving at high speed with respect to one another. Roger Penrose developed a similar argument in his book The Emperor's New Mind. It is called the Andromeda Paradox. Suarez and Scarani showed that for some relative speeds between the two observers A and B, observer A could "see" the measurement of observer B to be in his future, and vice versa. This is why we need the preferred frame above to understand entanglement. Because the two experiments have a "space-like" separation (neither is inside the causal light cone of the other), each observer thinks he does his own measurement before the other. Gisin tested the limits on this effect by moving mirrors in the path to the birefringent crystals and showed that, like all other Bell experiments, the "Before-Before" suggestion of Suarez and Scarani did nothing to invalidate quantum mechanics. These experiments were able to put a lower limit on the speed with which the information about probabilities collapses, estimating it as at least thousands - perhaps millions - of times the speed of light and showed empirically that probability collapses are essentially instantaneous. Despite all his experimental tests verifying quantum physics, including the "reality" of nonlocality and entanglement, Gisin continues to explore the EPR paradox, considering the possibility that signals are coming to the entangled particles from "outside space-time." Investigators who try to recover the "elements of local reality" that Einstein wanted, and who hope to eliminate the irreducible randomness of quantum mechanics that follows from wave functions as probability amplitudes, often cite "loopholes" in EPR experiments. For example, the "detection loophole" claims that the efficiency of detectors is so low that they are missing many events that might prove Einstein was right. Most all the loopholes have now been closed, but there is one loophole that can never be closed because of its metaphysical/philosophical nature. That is the "(pre-)determinism loophole." If every event occurs for reasons that were established at the beginning of the universe, then all the careful experimental results are meaningless. John Conway and Simon Kochen have formalized this loophole in what they call the Free Will Theorem. What Conway and Kochen are really describing is the indeterminism that quantum mechanics has introduced into the world. Although indeterminism is a requirement for human freedom, it is insufficient by itself to provide both "free" and "will". Indeterminism works primarily to block pre-determinism. Without indeterminism, no new information could be created in the universe.